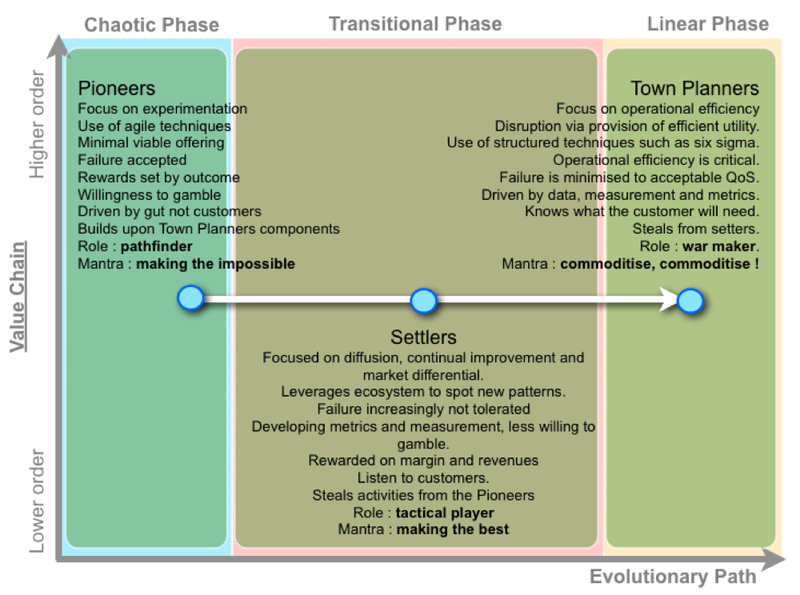 Back around 2005, in the days of Fotango, we had started to introduce a structure which I commonly refer to a Pioneer, Settler and Town Planner. This is structure which is not by type (i.e. IT, Marketing, Business Development) but instead by Flow (from chaotic to linear, from genesis of an activity to commodity). Under the structure, Pioneers are rewarded for experimentation and the genesis of new activities. Settlers steal successful patterns from the Pioneers or any wider ecosystem to create more defined components, a library of useful things. The Town Planners steals successful components from the Settlers to create commodity components through utility services with a focus on automation and standardisation. The advantage of the structure is that each group feeds of the previous with Settlers stealing from Pioneers and Town Planners stealing from Settlers. The circle is completed because the Pioneers build on the services the Town Planners create. Now back in the days of Fotango we started with IT and called these groups development, framework and operations however we had already started the process of folding business development and marketing into this structure. I know of three other companies that use such a structure, alas it's not enough to test the findings conclusively. That said, the early findings included a remarkable surge in efficiency and rate of genesis of new activities. This combined with our creation of a platform underpinning this concept led to some stunning results including the development and delivery of a prototype wiki with client side preview from concept to live on the web in under 53 minutes. However, the real beauty of the model is that it's self disruptive due to the structure creating a pressure for each group to steal from each previous group. The creation of such a pressure overcomes inertia which may have formed through past success. Our focus at Fotango was also on the development of ecosystems hence our entire platform was provided though "open" APIs back in 2006. We had several years of experience in building with web services and we intended to open source all the components in 2007 to create a competitive market with a view of establishing higher order systems such as exchanges, brokerages and assurance. Alas, there's another story here of political capital and inertia within large companies and since this is well documented, I won't go there again. 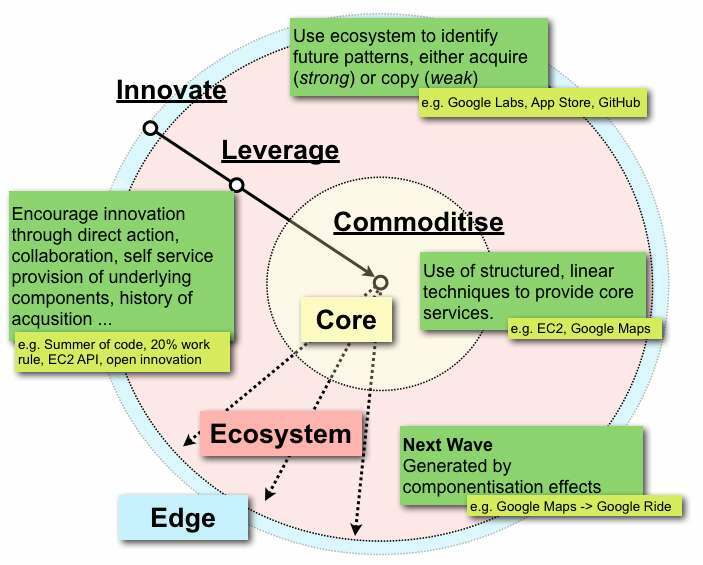 The model which I use to describe the goal of an ecosystem approach is known as Innovate-Leverage-Commoditise and its use is rather simple and becoming more common today. First, you start by providing more linear activities i.e. those suitable for utility provision because they're widespread and relatively well understood. Examples include compute resource, storage, databases etc. The purpose of these is to allow an ecosystem of other companies to build on top of your service and to encourage those companies to innovate (as in genesis of new activities) by reducing their cost of failure (through provision of utility services). In effect, some of those companies you can consider to be an extension of your own Pioneers. As any new activities spreads through the ecosystem, you should be able to detect this change in consumption of APIs. This is the Leverage component of the model as you use the ecosystem itself to do the pattern spotting and it in effect operates as an extension of your own Settlers. One a pattern is spotted, you commoditise this to utility services. Yes, you will be accused of eating the ecosystem, though you can always control this messaging by balancing acquisition vs copying. However, each time you eat the ecosystem, the new component services you create should help grow it. This balancing act is critical to keeping the ecosystem healthy. As a company, you will appear to be highly innovative (but in reality others are creating those new activities), highly customer focused (but in reality the ecosystem is telling you what you need) and highly efficient (because you're focused on utility services). Bye, bye the old mantra of choose one of these strategies. That's been a busted flush for many years. Now, as a very weak hypothesis the rate of innovation (genesis), customer focus and efficiency can increase almost linearly with the size of the ecosystem, though the volume of data is not strong enough to publish this (unless we're talking about various popular management publication in which case any old nonsense seems to get through). The beauty of this is that ecosystem growth can be super linear with the actual size of the company and hence if the hypothesis holds then it's possible to become super linear for innovation, customer focus and efficiency through an ecosystem model. Given what I know, this appears to be the case but it's not conclusively shown. Whilst competitors have built self contained Towers, Amazon has built a city with itself at the heart of it. The old model of big companies are less nimble is a busted flush here because genesis of activities and agility extend into the surrounding ecosystem. On Self Disruption and Super Linear. 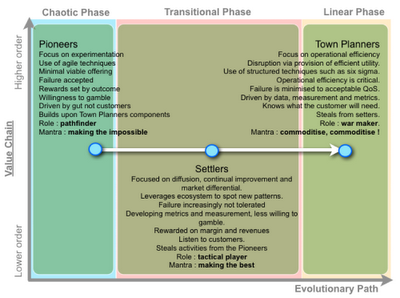 It's perfectly possible to organise a company using an ecosystem model such Innovate - Leverage - Commoditise around a structure of Pioneer - Settler - Town Planner. In this case the Pioneers works on encouraging and creating new activities - a mix with a heavy emphasis on Community Evangelists. The Settlers work on identifying the new patterns in the ecosystem and exploiting this - a mix with a heavy emphasis on Data Scientists, Strategists and Business Development. The Town Planners work on commoditising new patterns - a mix with a heavy emphasis on Engineers and Operations. There is no reason that I'm aware of why a company can't be both continually self disruptive and superlinear for innovation, customer focus and efficiency. In fact, the only reasons which I know that prevent this is the poor use of ecosystem (if at all) and poor structure (e.g. organisation by type). I suspect that Amazon will in the future be cited in endless "management" books on why these problems can be solved. This is also why I've said many times over the years that Amazon is likely to be that $1 trillion market cap company and it will become far more powerful the bigger it gets. I'm tired of people telling me that you can either be innovative or customer focused or efficient but you can't be all of them. I'm tired of people telling me that companies can't be super linear for the above and twisting Geoffrey West's work as evidence of this. I'm tired of people telling me that companies can't be self disrupting and that it's inevitable that companies will be disrupted. The above statements only hold if you build your company with management practices from the last Century. Open your eyes, the software world is already starting to operate in an environment where all of the above is possible and this will soon extend out into manufacturing (though commoditisation of the manufacturing process). Get used to it and start thinking about how to do this better than competitors. It's perfectly possible to do organise around this flow from chaotic to linear as long as you first start by realising that things evolve, as they do characteristics change and "one size fits all" doesn't work. The problem with this, is that it does make management more complex. And, alas their are two solutions to Ashby's law of requisite variety. In case you don't know the law, the controlling element of a system needs to have as much variability as the input and outputs of what is being controlled in order to be effective. Given organisations are complex systems, you can either solve this by a management layer which is able to cope with complexity or you can simplify the inputs and outputs to a point where the management layer can cope. What generally tends to happen is companies do the latter with KPIs and other tools. This in effect creates an illusion that the complex system is represented by a very simple dashboard and hence is more manageable where in reality the complex system is still complex and the management layer is choosing to ignore this.